Singapore's Chinatown is the island's traditional Chinese quarters and, whilst the entire city of Singapore is largely Chinese, the area still retains some of its original charm. The area is also known as Niu Che Shui (牛车水) in Chinese and Kreta Ayer in Malay, both names meaning "bullock cart water", a reference to the carts that used to haul in drinking water. The area between Pagoda Street and Smith Street has been tarted up considerably for tourists, but workaday Chinatown continues south and east, merging seamlessly into the Central Business District. Tanjong Pagar has many watering holes in restored shophouses, while Club Street caters more to the expat and yuppie crowd with small, intimate eateries offering excellent (if pricy) Western fare. Unlike most of predominantly Hokkien Singapore, the dominant Chinese dialect in Chinatown is Cantonese. Exit A (Pagoda Street) of North-East MRT line's Chinatown station will deposit you right in the heart of the action. Outram Park, Tanjong Pagar and Raffles Place are also all within walking distance, as is Clarke Quay and the Singapore River to the north. Chinatown's primary attraction is the town itself, composed as it is of restored shophouses full of strange little shops selling everything from plastic Buddhas to dried seahorses. Wander at random and see what you can find! Thian Hock Keng Temple, 158 Telok Ayer St, ☎ +65-64234616. The oldest Hokkien temple in Singapore, dating back to 1821, although the structure was thoroughly refurbished in 2000. The brightly colored, elaborate facade was constructed with ironwork from Scotland, tiles from England and the Netherlands, and dragon-ornamented granite pillars from China. Free. editChinatown is at its busiest and most colorful in the month preceding the Chinese New Year (Jan-Feb), when the streets are decked with festive decorations. Street markets are thronged with people, shows entertain the crowds and the drums of lion dances echo into the night. The festivities in a midnight countdown and a roar of firecrackers atop People's Park Complex, showering flaming confetti down below (steer clear!) — and for the two following days virtually everything is closed. Probably the most strenuous activity in Chinatown is avoiding touting tailors — which, incidentally, is illegal and can be reported to the police. People's Park Complex, one of the more well known malls in Chinatown. The central streets of Chinatown around the pagoda are packed with stalls selling all sorts of Chinese trinkets aimed squarely at tourists. There is also a cluster of (expensive) antique shops on South Bridge Rd. For Chinese handicrafts, antiques, fashion items, home accessories and Chinese medicine aimed more at the locals, poke into any of the numerous shopping malls. Chinatown is made up of pre-war shophouses, home to merchants who have been hawking the same wares for years – bales of fine silk, traditional handicrafts, and gold and jade jewellery. At the junction of Eu Tong Sen Street and Upper Cross Street, a large Chinese emporium Yue Hwa stocks an array of Chinese products such as tea, medicinal herbs, food, household items, antiques and traditional Chinese clothes such as the cheongsam. During Chinese New Year, the Chinatown Food Market buzzes with activities like lion dances and other street performances. A large variety of stalls are set up on Pagoda, Smith, Trengganu and Sago Streets during the festive season, selling traditional snacks and customary decorations. In shophouses on Ann Siang Road and Club Street, local designer boutiques such as Asylum and Style:Nordic can be found amidst traditional Chinese clan associations. A popular haunt for today's hipsters, this area of Chinatown blends traditional Chinese heritage with contemporary threads, quirky cafes and chic restaurants. Among the Chinese, the obligatory souvenir is some sweet red bak kwa (barbequed pork), available both fresh off the grill and in convenient vacuum packs. In Chinatown there is, needless to say, plenty of Chinese food to go around! But if you hanker for something different, Tanjong Pagar is also Singapore's unofficial Korean district and there are a large number of very good Korean restaurants too, plus a sprinkling of European fine dining establishments around Club St and Duxton Hill. On Friday and Saturday, Club Street is closed from 7pm to 1am and converted into public pedestrian space, allowing people to enjoy a vibrant street life. Two good hunting grounds for cheap eats are Smith Street, a single row of fancy stalls with the nicest ambiance of the lot and quite decent food too, and Maxwell Centre at 2 Murray St, just across road and a few minutes walk from Tanjong Pagar MRT. Most dishes in either location are less than $5, although seafood can get considerably more expensive. Note that most of Smith Street's stalls are open for dinner only, while Maxwell Centre is open 24 hours. Connoisseurs may also wish to check out the 2nd floor of the newly renovated Chinatown Complex, which hosts one of Singapore's largest hawker centres with over 200 stalls, but this labyrinthine warren of concrete and flourescent lighting is both hard to navigate and not exactly a treat to the eyes. 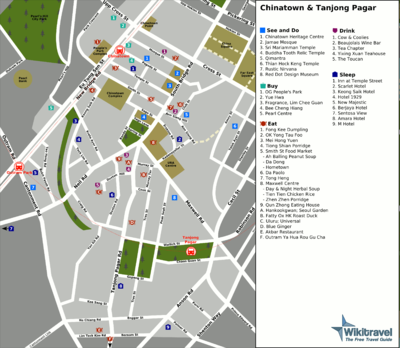 Chinatown and Tanjong Pagar have a vibrant nightlife. As you'd expect, karaoke boxes and their dodgier cousin the KTV lounge predominate, but the area around Club St and Ann Siang Hill has many upmarket wine bars catering to expats and moneyed locals. While there are a few ordinary hotels, the most interesting accommodation options in Chinatown and Tanjong Pagar are in renovated shophouses. There are a few hostels in the suburbs around Chinatown. Keong Saik Road, at the western edge of town, is a former red-light district which still retains more than its fair share of dodgy karaoke lounges — as well as a number of cheap, largely identical shophouse hotels, which look rather attractive from the outside but are all quite cramped, stuffy and dingy inside. This page was last edited on 18 January 2019, at 04:47.